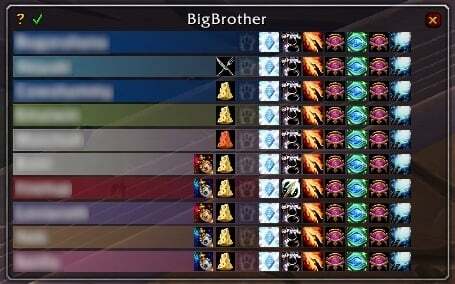 BigBrother watches over your group and has two main functions: checks and alerts. Checks show you an overview of your group's consumable usage and raid buffs with the option to output missing buffs to chat. The buff window quickly shows who is missing what. Food buffs are tinted red if it does not give the highest stat value available. Raid buffs are dimmed/disabled when you don't have them and hidden if the group can't provide them. You can also run a buff check to print out missing consumables and buffs from the buff window, config window, shift-clicking the minimap icon/broker object, or with the chat command /bb qc. Alerts spam your chat frame so you know when people use specific abilities or items. This includes things like when someone breaks crowd control, is misdirected, interrupts, taunts, resurrects, dispels, or puts down items the group can click on. If you output to self, you can also shift-click on the "BigBrother" text to send the alert to chat. Feel free to PM me an updated localization file. The enUS locale has all the localized strings I use in it. - Fix an error caused by pet names being nil instead of "Unknown"
- Rework Check on Ready Check so I can default it to off. Not sure if I want it off or only on your checks by default... off for now. - Use a single output for alerts (db changed, will default to self). I don't really see the point of having multiple outputs as it can get kind of spammy, however, if people were using them, I could revert this in favor of using a prefix and chat filters. If you can have the option of checking the runes, it will great! not just appear in the Buff window. Is this add on still alive? No response for quite some time. Any chance to include the three Augment Runes? Is it possible to change the bar texture? Does this addon do a Enchants check? Only buffs, I don't check anything that would require inspecting players. Curious if it is possible to output the reports to MSBT scroll area, would be much less "Spammy" for some encounters for the logs. Thoughts? Any chance for a 6.0 version soon? This edition is so much better than vanilla BigBrother. I have translated the language file zhCN & zhTW, Placed on OneDrive, I hope the next version can be update, thank you! Thanks for the report! I haven't uploaded an updated version over here yet, but I'll post one after I have some more time to make sure nothing else is broken. Last edited by nebula : 03-05-13 at 04:34 PM.